Samsung’s woes are common news now. Everyone heard about the exploding Galaxy Note 7. I know of one potential client who bought an iPhone over the cursed device, yet she was bent on it. To be frank, there is no equivalent device in the market right now, a device that truly and beautifully supports pen input, other than the slew of tablets with pens slapped on as an afterthought marketing strategy (no hard feelings, Surface Pro lovers). Despite its woes you have to appreciate how swiftly and efficiently Samsung responded to this. They quickly set up a recall program even before governments (such as the US) caught up with their plans. There are (reportedly) billions in the wind with this whole issue of course but true to their promise of being faithful to their customers, Samsung (and various carriers) planned exchange programs with loaner devices for those willing to wait for the fixed Note 7s and options to get Galaxy S7s and S7 Edge devices (complete with reimbursement) for those who wouldn’t as well as various assorted gift-cards. This was one incentive together with the firmware update that apparently limited the charge capacity of the phone’s faulty battery to 60% to (a) reduce the risk of explosion and (b) push users who would be disappointed by the reduced battery capacity to turn in their devices. 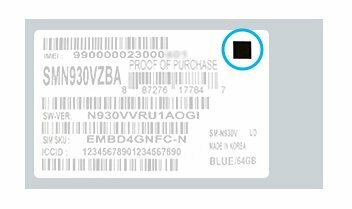 The label on the box containing the new fixed Note 7 has a black square symbol on the upper right corner. When you turn on your (new and fixed) Note 7, you will find the battery icon green instead of the old white throughout the OS (on the status bar, the always-on display and the power off screen).